The Broadway musical is one of America's great indigenous popular forms, a glorious hybrid that emerged "out of our speech, our tempo, our moral attitudes, our way of moving" (as Leonard Bernstein put it). Now in the second volume of a landmark two-volume collection, The Library of America presents eight enduring masterpieces charting the Broadway musical's narrative tradition from the genre's Golden Age to its response to the turbulent 1960s with the Tony Award-winning shows Cabaret and 1776. Based on new research, this historic collection presents the complete libretto of each musical in its Broadway opening night version, making these beloved stories available as never before. Several shows, including Guys and Dolls and My Fair Lady, return to print for the first time in decades. Each of these classic musicals has evolved over time, receiving many important revivals and new productions. This Library of America boxed set offers readers unprecedented insight into this living history with a selection of hard-to-find or previously unpublished supplementary items, including lyrics of songs dropped out-of-town or added in later revivals. 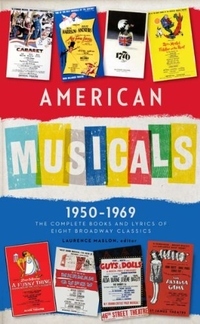 Lavishly illustrated-- with 32 pages of photographs and other images drawn from the original productions, the set also contains biographical sketches of the book writers and lyricists; cast lists and other information about the shows' Broadway openings; and detailed accounts of the path each show took on the road to Broadway.